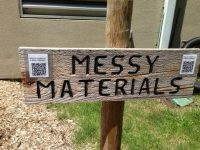 The staff of UPC Discovery and the congregation of United Presbyterian Church began their Nature Classroom in June 2011. The church building had been a school and already had a large playground structure. United Presbyterian Church has a large natural campus and is an official National Wildlife Habitat with many distinct species of flowers and trees. Families of geese and ducks roost in the spring and occasional deer or wild turkeys visit. 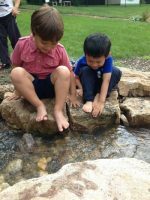 Children were able to explore this with their teachers; however, the preschool committee wanted space for child-initiated exploration of the natural world. 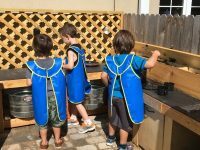 The Nature Explore Classroom is structured with learning centers. First centers to be built were a Nature Art Center, a Gathering/Tree House Area, Messy Materials and a Garden. Other centers were provided by bringing equipment outside. More permanent centers were then added including a Building Area, a Waterfall, a Mud Kitchen, a Grassy Maze area, Music area, and a Bird Reserve. Trails were added to make natural wooded areas accessible to children, teachers, and families in supervised experiences. A Woods Trail is immediately adjacent to the Nature Explore Classroom for easy and quick access and a more distant, but within walking distance, Creek Path leads to a shallow creek complete with sandbars and a rocky beach. 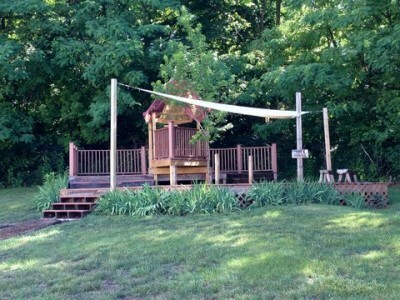 A pergola entry feature on one end and a trellis over a berm beckon children to enter into play in the natural play centers. A large multi-level deck invites large groups to gather for a story, class meeting, or creative movement and is used by all ages of the church. Its dual purpose as the Tree House also invites children to create their own environments using cloth and movable logs and benches. In the Messy Materials area, children dig in the dirt and construct with sticks and logs. Children work together to build structures or hunt for bugs. Logs, sticks, large and medium size rocks, tree cookies, and mulch invite construction and play. 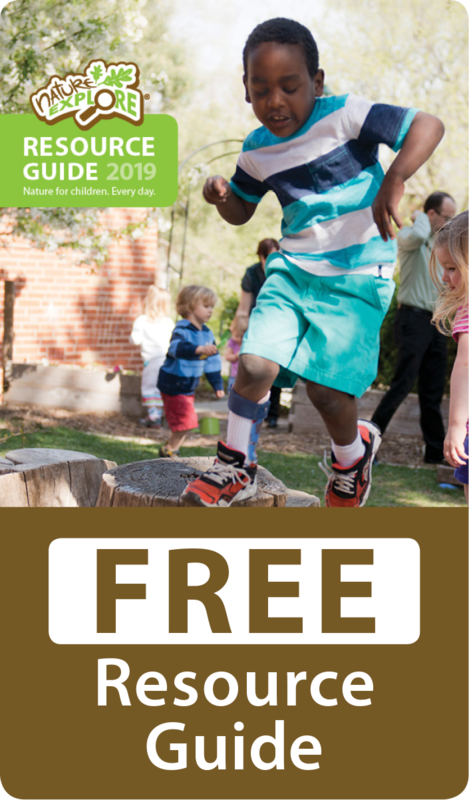 The Garden provides opportunities for learning about the growing cycle of plants, how weather conditions impact plant life and nature as a source for the food we eat. The Nature Art area encourages children to examine materials like pinecones, stones, sticks, and leaves and create natural designs. Easels provide opportunities for them to study the surrounding woods and represent their observations through painting and drawing. The waterfall was installed in the spring of 2014. It invites children of all ages to gather and enjoy the peaceful sounds of gently flowing water. Although it is a pondless waterfall which is turned off each evening, it still attracts natural creatures. Children have discovered frogs and water bugs making their homes in the protected boulders of the waterfall. 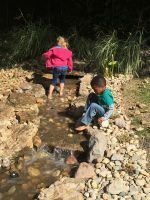 A water feature not only provides a peaceful, contemplative place for young children but also encourages children to explore the natural scientific properties of water! The Nature Explore Classroom has been a huge success and is a favorite of young and old alike.